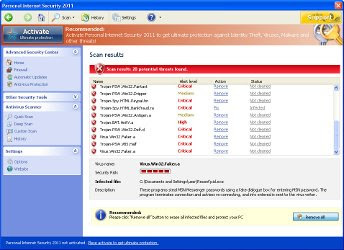 Personal Internet Security 2011 is a fake security program that pretends to be an antivirus tool. This malware from the same family of rogues as Internet Antivirus 2011, Smart Engine, Smart Security , My Security Shield, Security Master AV, etc. The program looks like a normal antivirus but, in reality, it can not remove viruses, trojans, etc., nor will be protect your computer from legitimate future infections. Personal Internet Security 2011 is created with one purpose to trick you into purchasing the full version of the software. Personal Internet Security 2011 is promoted and installed with the help of trojans. When the trojan is started, it will download and install the rogue onto your computer. During installation, Personal Internet Security 2011 will be configured to run automatically every time when your computer starts. After that, it will create several files on your computer, which later, during the scan, will detect as infections. These fake infections can only be removed with a full version of the program. As you can see, Personal Internet Security 2011 is absolutely useless and what is more, even dangerous software. Most importantly, do not purchase it. Instead, please use the Personal Internet Security 2011 removal instructions or the steps below to remove this malware from your computer for free. looks like it worked! these instructions were easy to follow and saved my computer. :) thank you.